Resolutions turns 8 years old today! It was released on 25 January 2011 on Paper + Plastick (re-released on Rise Records in 2013, European release on Xtra Mile Recordings). Dave Hause has been on the road most of his life. He released third solo album Bury Me In Philly in February 2017, six years after debut album Resolutions, 13 years after forming punk band The Loved Ones, and almost 20 years since releasing his first album with his band Step Ahead. The songs he's written, while easily identifiable from each period or project, are attached by a throughline of honesty and devotion. Dedicating himself to his craft was part of the reason for creating Resolutions, as he found that he had more to say, or things to say in a different way from the music produced by The Loved Ones. Rather than hold these songs in, he's continued to craft them in his own fashion. Resolutions stands on its own as an excellent record among the XMR back catalogue. Largely upbeat in sound with memorable electric guitar lines, some piano, organ, and a few other surprises placed upon its acoustic roots, the album's heart is in Dave's stinging lyrics. Not one to shy away from vulnerability, his words tie that honest throughline tighter with each observation and self-reflection. It's wrought with hints of the musical pace and tone of his ongoing work with The Loved Ones, but its emotional impact is all its own. Dave was kind enough to answer a few questions about the album while on tour in the UK for Bury Me In Philly in March 2017. You can buy Resolutions from Xtra Mile on CD, vinyl or download. We also have a few copies of the 'C'Mon Kid' 7" too. Xtra Mile Recordings (Brad Barrett): When you look back at the time Resolutions was being made, what stands out most? Dave Hause: It was a really pure moment in time. I had no real intention of turning that record into a “solo career”, I just wanted to flesh out those songs in a different setting than The Loved Ones provided at the time. My best buddy Brendan (drums) lived around the corner, and my sister Missy lived close by too, so we’d just drink bottles of wine and work the songs out in my old attic. It was really fun. How does Resolutions fit into your overall body of work – does it feel like progress to you or a reset? Dave Hause: Both. It reset things by accident. When I did the Revival Tour* in autumn 2011, it introduced my music to so many new people that it compelled me to just keep going by myself, which gave birth to (second soloi album) Devour, touring with my brother, then Bury Me In Philly and now The Mermaid (Dave's current tour band). It also is a link in a long chain of songwriting for me. It sounds logical to go from The Loved Ones' Build & Burn to Resolutions, and then from that to Devour. It’s part of the journey. * The Revival Tour is almost a rite of passage – led by Hot Water Music's Chuck Ragan, he and three other artists go on the road to perform live in a collaborative acoustic musical mission; other participants have included Frank Turner, Dan Andriano and Brian Fallon. How much of an impact did the Revival Tours in 2009 and 2011 make on you as a solo performer? Dave Hause: Huge. The camaraderie and fearlessness that Chuck develops on those tours is truly infectious. It makes for a show that is greater than the sum of it’s parts. It’s spontaneous, risky, and without ego and artifice. Those tours were a gift. I hope we can do more. Do you tend to listen back to your records and what was your reaction to the last time you listened to Resolutions? Dave Hause: I think it’s unique. I don’t often listen back, but I have lately because one of my goals on this first headline tour on the new record is to play every song off of all three records before we finish this 19 show run, so I’ve had to delve back into it. It definitely a “singer-songwriter” record, greatly influenced by Conor Oberst’s Mystic Valley Band, but it also can’t quite shake the punk that Brendan and I grew up listening to and playing. That is really charming and fun to hear. It makes it a unique sound. I sometimes look back at things I've written and don't understand exactly where they came from. Is Resolutions at all like that? Dave Hause: I would say so, yeah. But if memory serves, they just sort of poured out, and I didn’t spend a ton of time tweaking them and rewriting. I figured we could leave some of the axe marks in the wood, and that not everything needed to be sanded perfectly. We did the heavy sanding and polishing on Devour though. As one of many who wrote and performed songs solo after years of being in punk bands, did you feel any pressure to either redefine your songwriting or acknowledge that past? 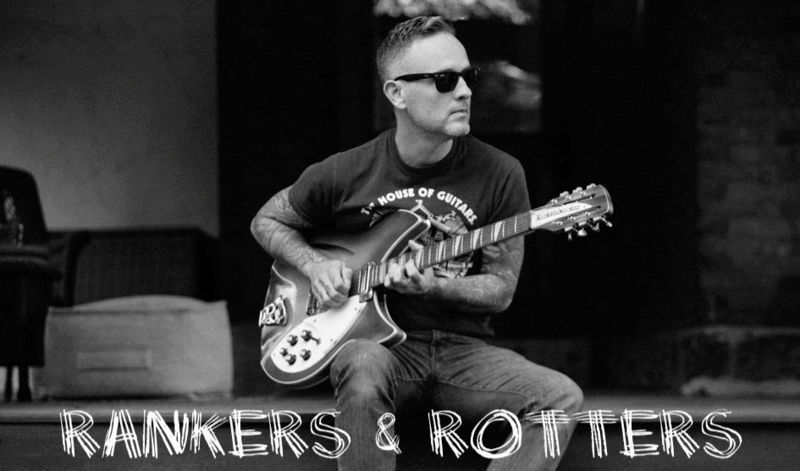 Dave Hause: I felt that pressure from the minute The Loved Ones signed to Fat (Wreck Chords). I knew it was a good home and that they treat their bands fairly, but I also know that it is a subculture that can tend to keep its own glass ceiling on what you’re “allowed” to do as a “punk”. It drives me crazy to this day that bands like Alkaline Trio and The Bouncing Souls don’t get their just dues as great songwriters. I wanted the thing I spend the most time on to get its proper day in the sun. I’m way less worried about all of that now, but maybe just due to relaxing with age and being grateful for what you do have, rather than being concerned with nonsense that’s beyond just the act of connecting through music. That’s the point. Lyrically, you didn't shy away from the personal on your first solo album and that still remains the case. Does this make listening to and playing older songs a challenge? Dave Hause: Sometimes. They’re often snapshots of where you’re at when you write them, but they’re often obscured snapshots. They often are beamed through a prism though, where you can use creative license to tell a better story. Once you’ve put them out, they’re for the people who love them, and the meaning changes. How much would you do differently – if anything – given the chance to tackle Resolutions and that period of your career again? Dave Hause: I wouldn’t change much. I would just have doubled down I think. More songs, more recordings, more shows. Life's short. Finally, do you laugh at 'Years From Now' or think “yep, actually that was spot on”? Dave Hause: Why would I laugh at it? Do you? (Brad: Absolutely not - I think it's an excellent song). It was a love letter to my new little nephew and niece. Just some quick advice that I figured they’d hear and maybe a few others would too. Cringing later at your vulnerability is lame. That song is what it is, and is useful to whoever needs it at the time. Thanks again to Dave Hause for his time. Catch Dave on tour (we have his forthcoming dates here) and visit his website www.davehause.com to see what he's up to, buy merch and find his other fine records. While we´re at it, here are some other interesting interviews with Dave about RESOLUTIONS.